This year I decided to do an unconventional basket for the twins. I initially intended to make a regular basket and put the boots on the side but decided this would be a lot more fun! Plus, I have a tendency to go overboard on holidays, forgetting that the twins are only two and don’t need much. Only having as much space as a pair of size 8 toddler boots puts a limit on how much can go inside! I got these dinosaur boots from Lone Cone. My original plan was to put everything they got – candy, toys, etc. – into its own little plastic egg. I’ve become that parent that lets my kids watch surprise egg videos on YouTube and I often catch them playing independently, saying “Open, open, SURPRISE!” With these, I couldn’t fit exactly as many eggs as I could into a basket, but I still wanted to use everything! So I found a way to make everything fit and still make it cute. To start, here’s everything that’s in the baskets. There’s just one of everything! They have plenty of stuff to share. The boots aren’t very big since they’re for little kid feet, so I had to make sure I squeezed in everything as much as I could! There are items going all the way up the boots, even down into the toes. 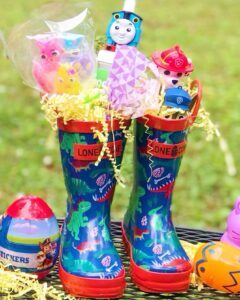 I made each set have one boot for snacks and one boot for toys. For the snack boot, I put a pack of Gushers down in the toe. The loot bag of crunchy snacks went in the top with the juice bottle right behind it, and the lollipop sticks nestled in the side. Easy! I put Easter grass in the empty spaces at the opening – just a little goes a long way. I did NOT put Easter grass all the way down the boot. For the toy boots, I stacked small toys all the way up, squeezing the “squishy” toys (Mash’Ems) into the toes and stacking the regular ones above that. I ended up having to kind of balance the topmost toys at the opening, which actually made for a nice presentation. A tiny bit of Easter grass in the empty spaces at the top and done! 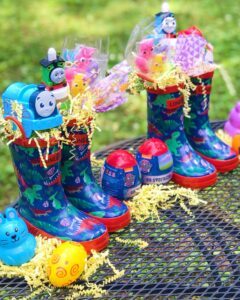 Since I couldn’t fit Easter eggs down in the boots, I put a few with candy and stickers on the side to open separately. I think these boots will be a big hit! I can’t wait to see them open them on Easter Sunday.